~400HP V8 - streetable with mild manners. Not mine but I did purchase it. Been asking for one for a long time. I enjoy sweating copper but there are times that I need the repair to take as little time as possible. When I asked I asked for the top of the line Propress and ended up getting it. It will pay for itself is less than a year. 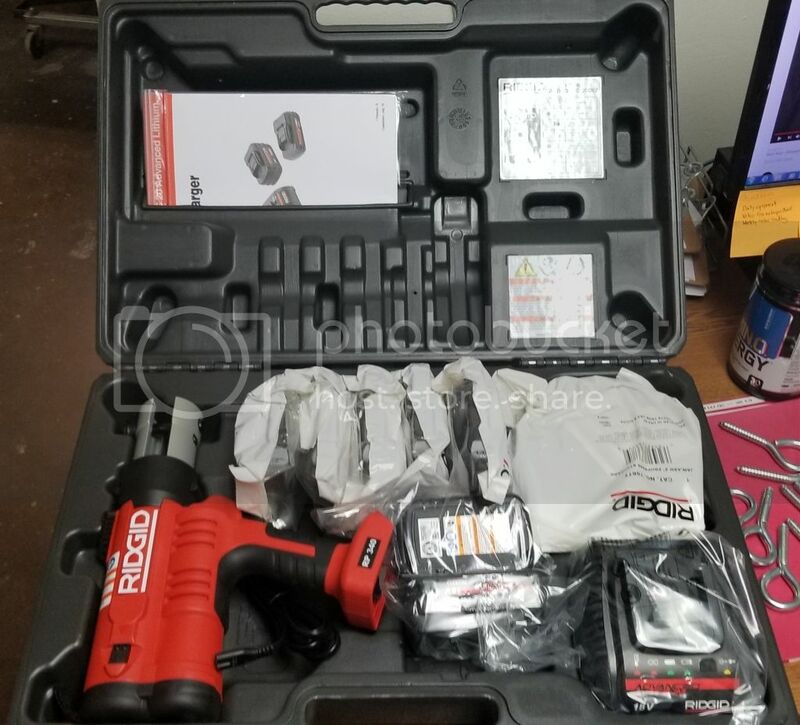 This is the most expensive set they make as far as I know at $3300 my cost and does 0.5" up to 2". Last edited by GhostAccord; 04-05-2019 at 03:02 PM. Speaking of yours. Anything new? Haven’t had many updates on the ridge line or Accord. I was following your blog. Speaking of yours. Anything new? Haven’t had many updates on the ridgeline or Accord. I was following your blog. The blogs get up and go, kind of got up and went after the whole photobucket shyte. Winter is a tough one for me to get any work done on vehicles. During the winter months my garage is no longer a working garage, it's a storage garage for all the out door summer stuff. It's an '02 EX sedan; F23, obviously, and manual. It's got hail damage, but he only traded a cheap shotgun for it. The debate right now is whether to stick to the important stuff and try to sell it for profit, or take it a bit further and keep it so he has a fun daily that's better on gas than his current cars. Good news is that the engine and trans (short of the clutch) feel great, so it just needs a basic high-mileage tune-up and aesthetic fixes. We've already got the interior gutted for detailing and have a long to-do list written up on the broken windshield. I'm really looking forward to this restoration/resto-mod. I've always loved this body style, and it'll be interesting to see what changed in the engineering since the CB. Wasn't there a thread recently about interesting finds in used car purchases? Yeah... meth pipe. That's why we gutted the car, for deep cleaning to make sure nothing else that could get him in trouble was hidden away. 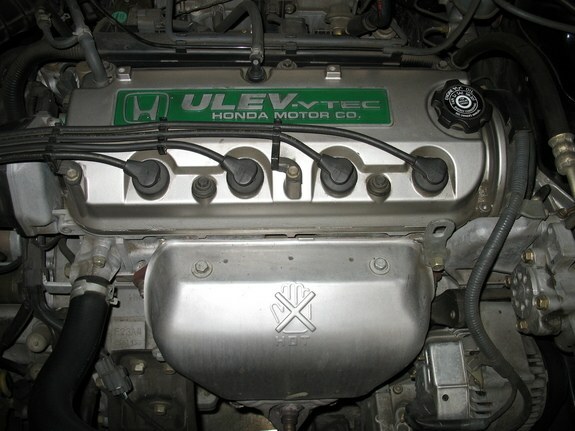 While we were at the junkyard getting parts for the CG, I grabbed one of these F23A4 covers I'd never seen before (not my photo), since I'm beginning to collect as many unique Honda valve covers as I can find. They're all going to be painted white with sanded letters and hung up in the garage. Maybe one day I'll be able to cover an entire wall with white Honda valve covers. 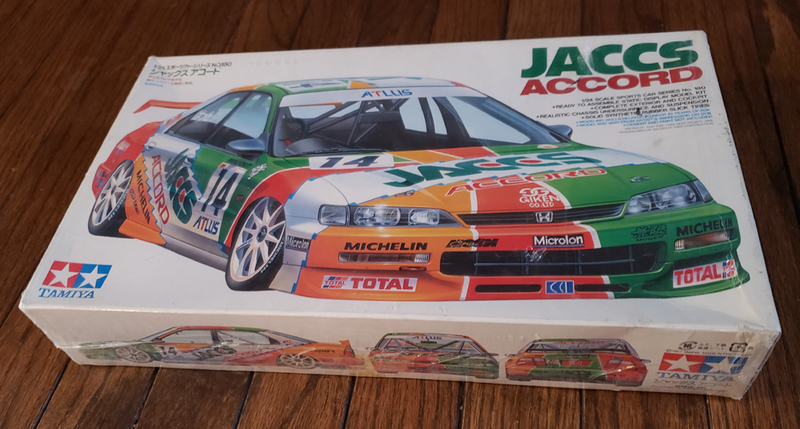 Although I might have to leave the box green on this one; it's kind of cool that an Accord was the first car to receive ULEV (and the following year SULEV!) status. Last edited by CyborgGT; 04-08-2019 at 01:18 AM. My wagon has a Honda muffler with lifetime warranty, except that Honda doesn't have them any more. It is rusting out along several seams, not loud yet. 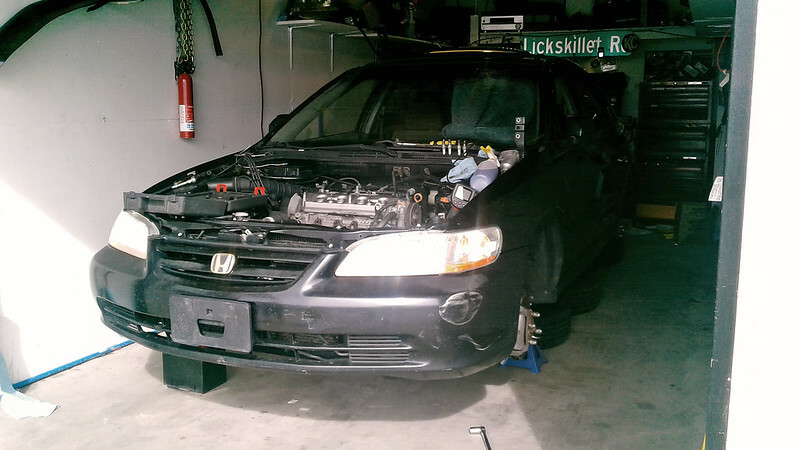 Talked to my local parts guy, who talked to local rep, who said, buy a muffler and Honda will reimburse me for it. 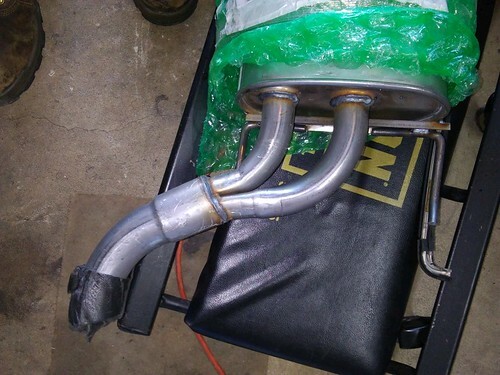 Ordered an ANSA EX muffler from RockAuto (the LX version consisted of 2 separate pipes and the muffler which all had to be clamped together - I preferred the welded assembly similar to OEM. So this is what showed up. The 2-to-1 pipes are pinched severely then cluged into a single pipe - probably restrictive and ugly as hell. I think the OEM EX muffler has a much smoother transition. Talked to a local custom exhaust shop about cutting these off and fabricating two parallel S bends. $80 estimate; I'll see what I can get RockAuto to do about it. April 17, 2019: One thing leads to another. Tried to install it; the pipe hits the underside of the lower control arm - the forward end of the pipe is still 1.5 inches below meeting the end of the B pipe. 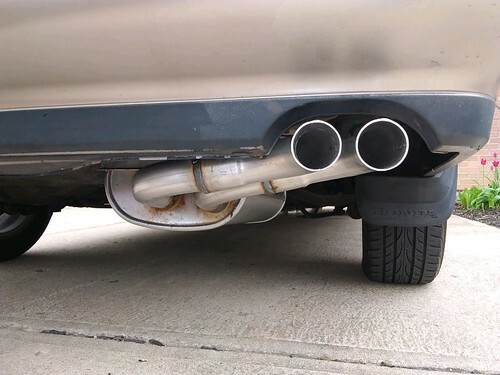 RockAuto will refund about half the cost of the muffler. April 19, 2019: Had a local shop modify it to fit and make dual exit pipes. Last edited by fleetw00d; 04-19-2019 at 07:27 AM.